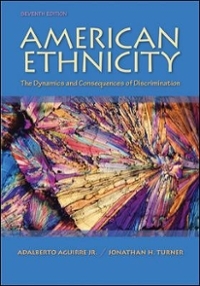 American Ethnicity: The Dynamics and Consequences of Discrimination 7 Edition American Ethnicity is a brief text that provides an accessible introduction to the dynamics of racial and ethnic relations. Key concepts and theories are summarized, and the authors develop a simple theoretical framework that guides the presentation of data on each of the prominent ethnic groups in America. As a result, this book examines each ethnic group from the same perspective, allowing students to compare the dynamics of discrimination against African Americans, Native Americans, Asian and Pacific Island Americans, white ethnic Americans, and Latinos.